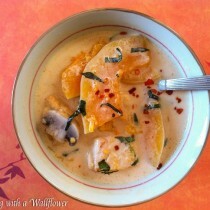 Rich butternut squash with sliced mushrooms and lightly fried tofu in a creamy coconut soup topped with shredded fresh basil leaves and crushed red pepper. 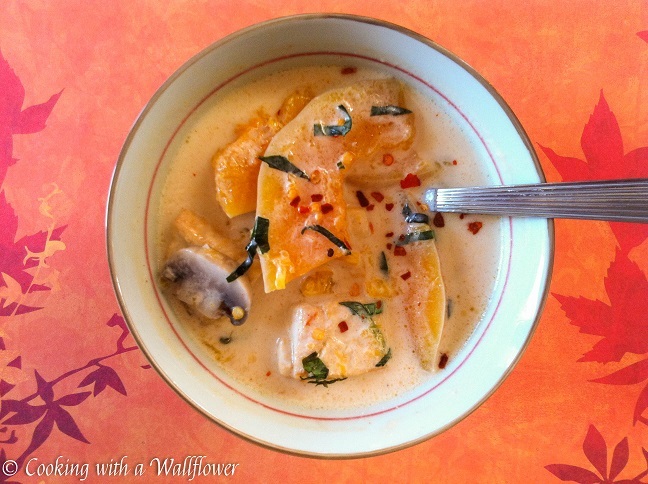 Slightly spicy and creamy, this butternut squash coconut cream soup is perfect for the fall and comforting in the winter. Ahhh! It’s almost Thanksgiving! Have you figured out what you’ll be serving yet? I think I finally have an idea what we’ll be serving for Thanksgiving dinner. Better late than never, right? And have you entered the Building a Framework e-Book bundle giveaway yet? There’s still time! Anyways, this butternut squash coconut cream soup was one of my absolute favorites growing up. It’s one of my mom’s signature dishes when we were kids. And it’s still one of my favorites now. The fun thing about eating this soup over the years is that it’s almost never the same. Why? Because you can add whatever you want to it. My mom loved changing the recipe, making it unique so that the kids wouldn’t ever get tired of it. And it was always loaded with healthy ingredients. But for this recipe, we’re keeping it real simple with just three main ingredients: sliced butternut squash with the skin peeled, sliced mushrooms, and lightly fried tofu. In my parents’ version of this soup, the ingredients always varied. Most of the time, it includes kobacha squash, tofu, wood ear, and fresh peanuts. Occasionally, sliced green beans are tossed in as well as mushrooms and dried bean curd sheets (tofu sheets). See? It really varies. So customize your soup however you like with your favorite ingredients. First, add about two tablespoons of vegetable oil into a skillet over medium to high heat. 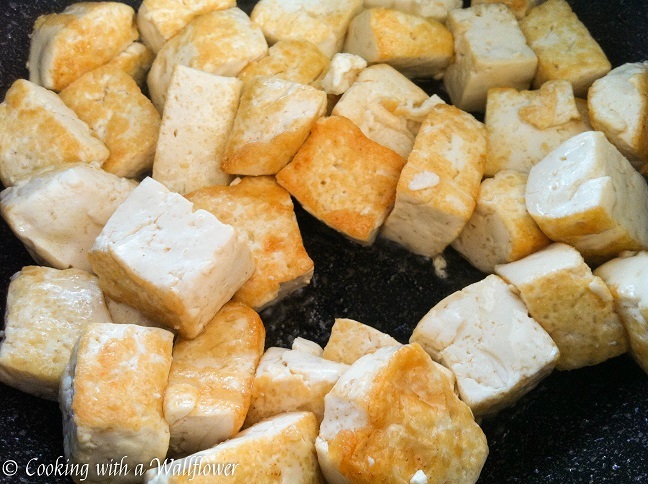 Add the chopped tofu into the skillet and cook them until the outer edges turn golden brown. Remove the tofu from the skillet and set aside for now. In a medium to large pot, pour in the vegetable broth. 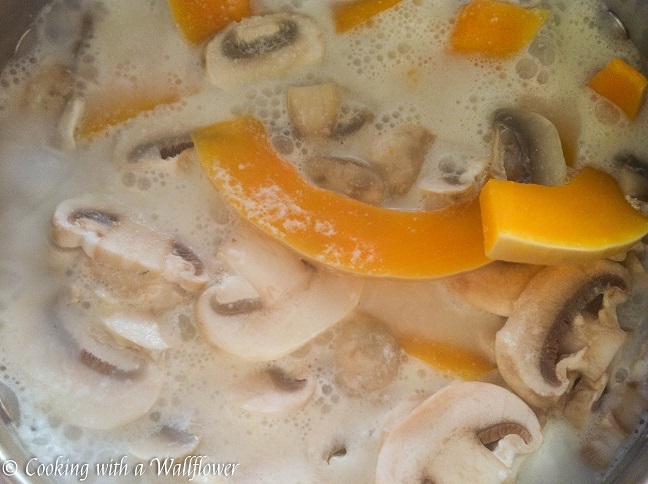 Then add the butternut squash and mushrooms. Cook them for about 8-10 minutes over high heat until they’ve softened. Stir in the coconut cream, sugar, paprika, and salt. Then add the fried tofu. Stir to evenly incorporate all the ingredients. That’s all there is to it. 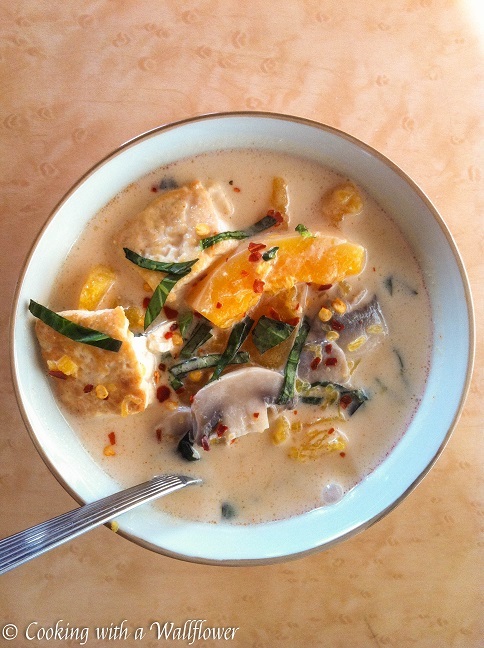 I love the richness of the coconut cream in the soup. It provides so much flavor that you don’t need too much extra seasoning. 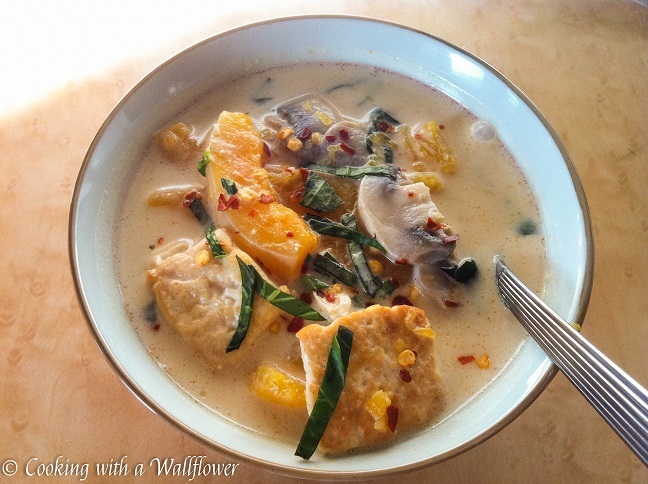 You can garnish the soup with fresh chopped basil and a sprinkle of crushed red peppers. If you like, you can season the soup with a little bit more salt and serve the soup with rice or noodles for a more filling meal. I’m entering this recipe in the Chums Family Favourites Blogger Competition. Add the vegetable oil into a medium sized skillet over medium heat. 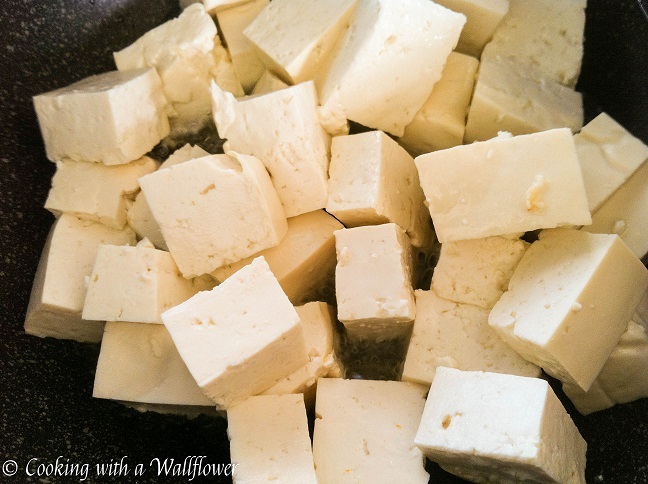 Carefully add the cubed tofu into the skillet. Stir the tofu to cook it evenly until they become golden brown on all surfaces, about 5-10 minutes. Once the tofu turns golden brown, remove them from heat and set aside for now. Pour vegetable broth (or water) into a medium to large sized pot over medium to high heat. 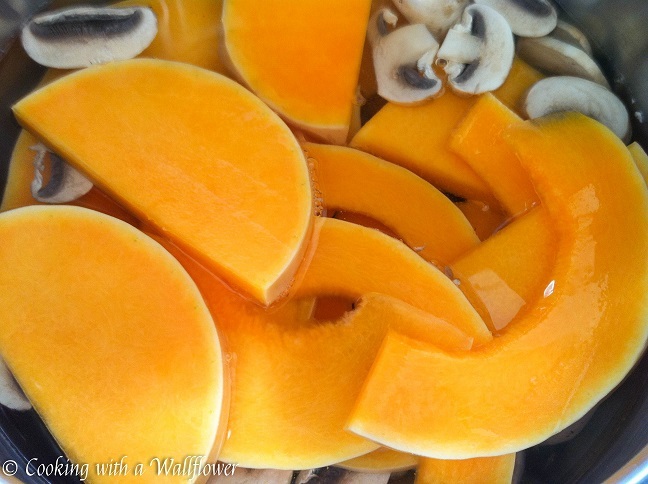 Add the butternut squash and sliced mushrooms. Cook them until they have softened, about 10 minutes. Then stir in the coconut cream, granulated sugar, paprika, and salt. Lastly, add the lightly fried tofu. Stir the ingredients to evenly incorporate them. Allow them to simmer for about 5 minutes. Serve the soup garnished with basil and crushed red peppers. 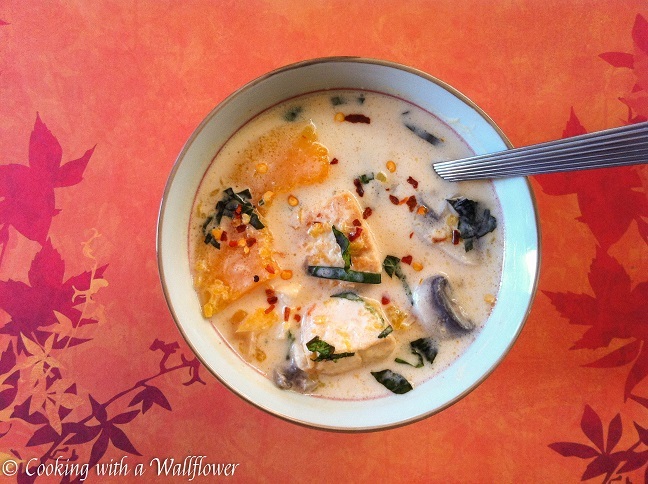 This entry was posted in Asian Inspired, Entree, Fall Cravings, Gluten Free, Quick and Easy, Recipes, Soup, Vegan, Vegetarian and tagged butternut squash, gluten free, quick and easy, soup, vegan, vegetarian. 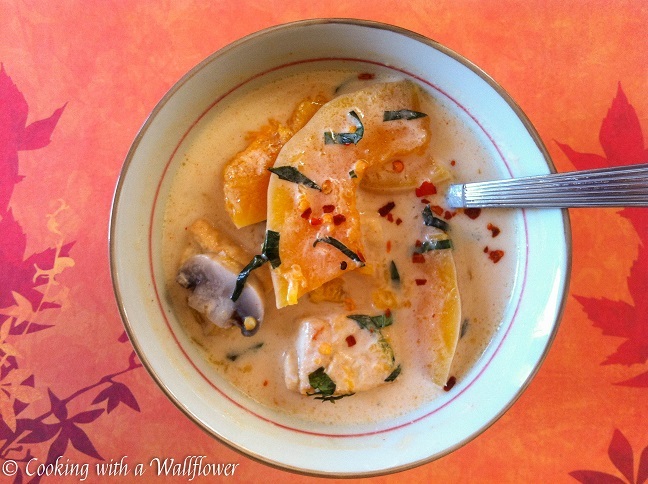 I wouldn’t have thought of putting pepper with squash, but when you factor in the coconut, that sounds amazing. This looks amazing! Definitely on my menu this week. This looks so good! Definitely trying this! Yes, I do and thanks, my friend. This looks delicious! Any suggestions on substitution for the tofu? I want to make this but I’m over my tofu phase. Would chicken work?